LED101 will take you through the basic A to Z of LED technology: from their physical construction and components, to the various ways they can be integrated into an architectural/EGD/XGD context. Learn about specifications, pitch, size and resolution as well as how they affect application. Gain valuable insights on using LED technology for signage, graphics and an ambient light source. 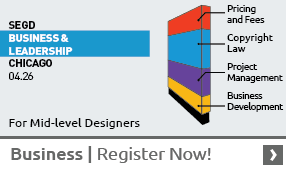 Engage in in-depth dialog about technology, projects and design with a leader in the field. Deploying digital technology into projects. This course contains 6 videos, including a Q&A Session between Speaker and Participants.